My Perfect Imperfection necklace from Orchid Collection is exhibited on Weston Beamor Stand at International Jewellery London. 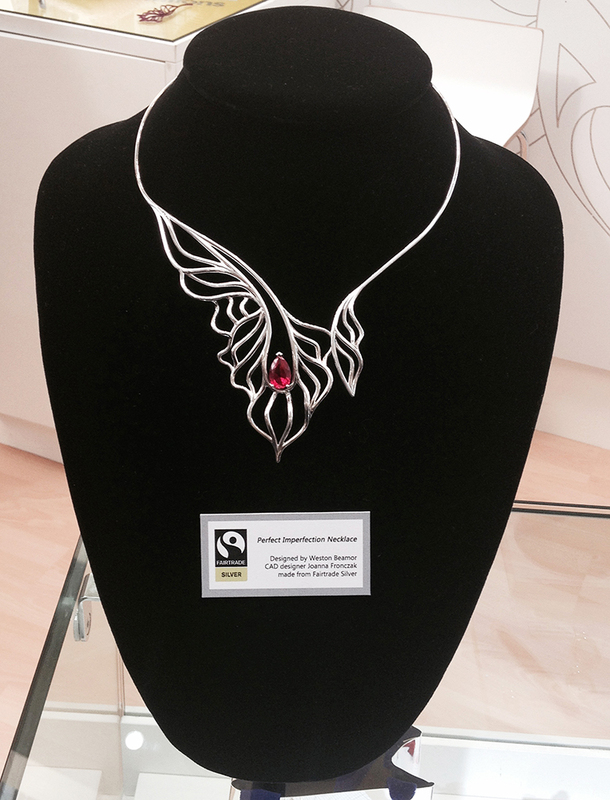 Inspired by beautiful Orchids necklace is fully created from Fair Trade Silver and Roby. This necklace is introducing my New Collection which will be present in early June 2015. 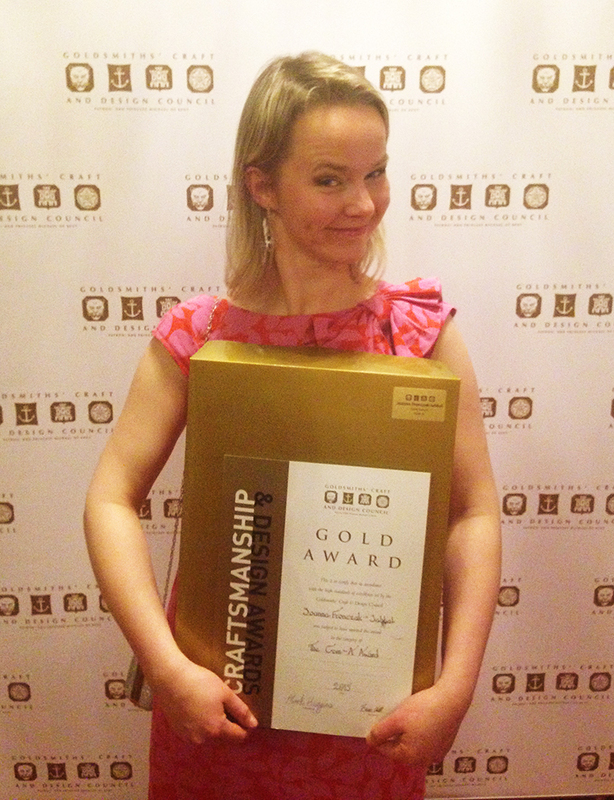 I am happy to announce that during The Goldsmith’s Craftmanship and Design Awards I did obtained Gold Award. 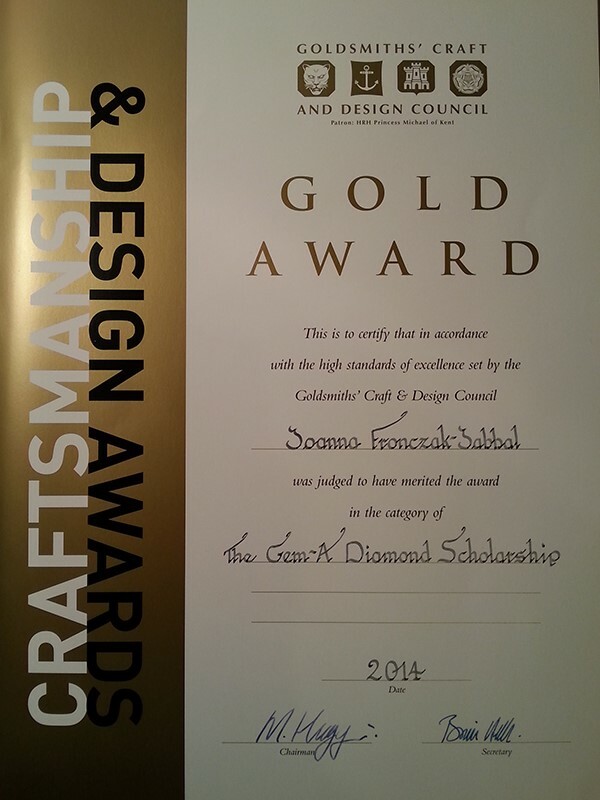 I was delighted to receive as a reward The Gem-A Diamond Scholarship during Goldsmiths’ Award Ceremony. 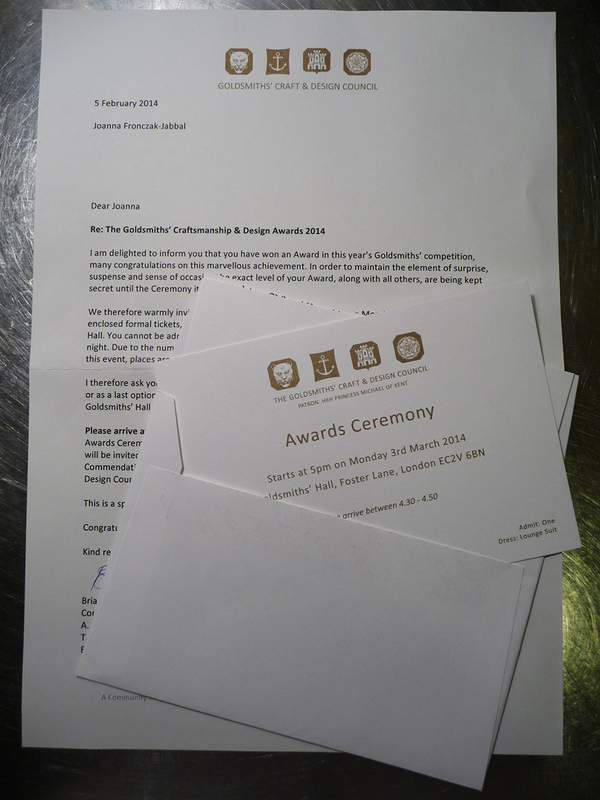 This amazing prize will help me to develop my skills further and perform better as a designer and maker. I believe that to be a good designer I need to have a deep understanding and respect for all the materials which I will work with. It is a privilege and a huge motivation for future work as well as personal development. 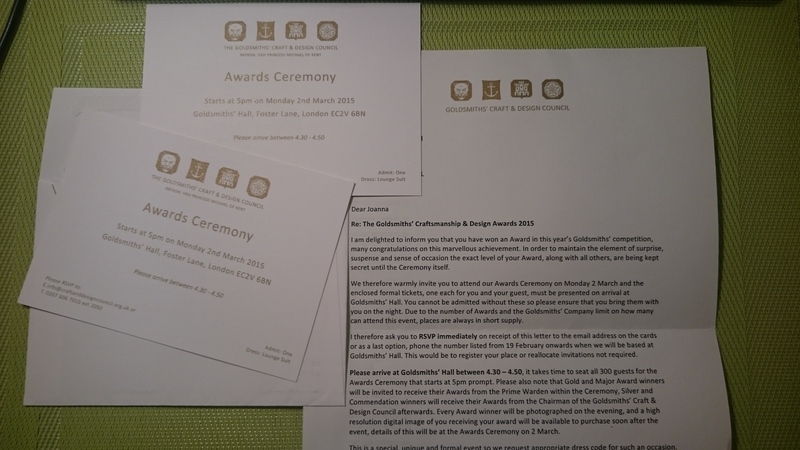 I am happy to announced that my work was selected for the Rising Stars 2014 and it my pieces will be exhibited at 3 exhibitions – New Ashgate Gallery, Artworks MK and Smiths Row – in between March and July. I became Trend-Scout of polish jewellery 2013. 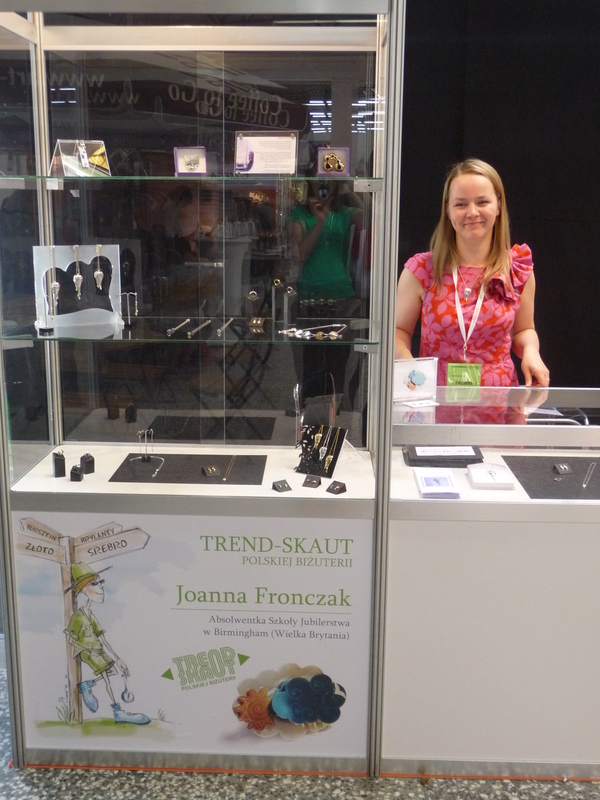 I will be promoted in polish jewellery industry magazines, websites and I was honored to take part in Jubinale – Summer Jewellery and Watches Trade Fair in Cracow, Poland. Main Prize in Cometition Play Metal Clay! ≈ Comments Off on Main Prize in Cometition Play Metal Clay! 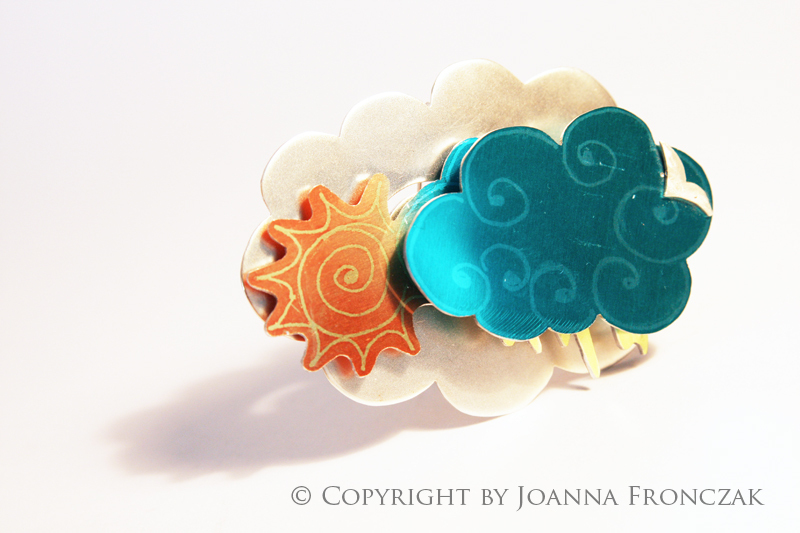 I am flattered to announced that I received Main Prize in Competition Play Metal Clay for my Weather Brooch. The competition was organized by Wytwórnia Antidotum in Warsaw, Poland. The subject of the competition was “Antidote for a crisis”.